served for 18 years as a Royal Marine were I began to understand the meaning of fitness and an understanding of how our bodies work. Upon leaving the marines I wanted to put this knowledge to use in my second career, I trained with Mel Cash at the London School of Sports Massage, which I left with BTEC in Sports Massage with Credit & Kinesio Taping (K-Taping). I have always considered that an holistic approach to treatments is the best way to deal with the causes of the problem and not just the effect. I am a now a Clinical Aromatherapist and had the privilege to be trained by the world renowned Aromatherapist Valerie Ann Worwood, author of many books on the subject her most famous being 'Fragrant Pharmacy, and also a qualified acupunctarist for sports injury and remedial treatments. 10 years on I have gained a huge amount of 1st hand knowledge and experience and have become a member of the Sports Massage Association, the Institute of Sports and remedial Massage and the Complementary and natural Healthcare Council. I have worked with Plymouth Albion Rugby Football Club for 7 seasons, Devon Rugby for 4 seasons, also Julia Hubbard who is the World Masters Athletic Champion at 200m and also the British Indoor Master Champion for her age group (35), and more recently Ruta Meilutye the young Lithuanian Olympic Breaststroke 100m Champion. The real champions of the practice are your recreational weekend Golfer, football and rugby players or squash, tennis and many other amateur or semi professional sports people. My skills are not just for the "sporty types I have many clients from all walks of life plumbers & builders, housewives, office workers and executives, school children to old age pensioners the eldest is 82. I would be very interested to hear from you sporty or not, young or old, if you have any questions or to ask about a consultation please call. 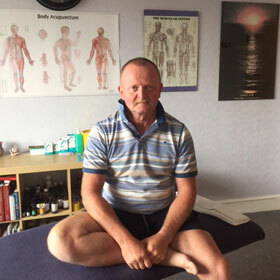 With over 12 years knowledge and experience a member of the Sports Massage Association, the Institute of Sports and remedial Massage and the Complementary and natural Healthcare Council.